No innuendo intended, those are the lovey-dovey names of a couple of our new products being released tomorrow in the Stampin' Up! Spring Occasions Catalog!! Starting tomorrow, January 6th, 2015, we also begin our annual Sale-A-Bration event!! You can earn FREE products from the Sale-A-Bration catalog with every $50 purchase from either the Annual Catalog or the Spring Occasions Catalog! Set yourself up for Valentines Day; Easter wishes and celebrations made easy, get ready to rock Graduation parties and announcements; Mothers Day and Fathers Day we've got you covered! You'll love the new stamp sets, project kits, and accessories being released in the new catalog tomorrow, be sure you stop by & check it out! So, as I was saying, today's cards are Valentines. 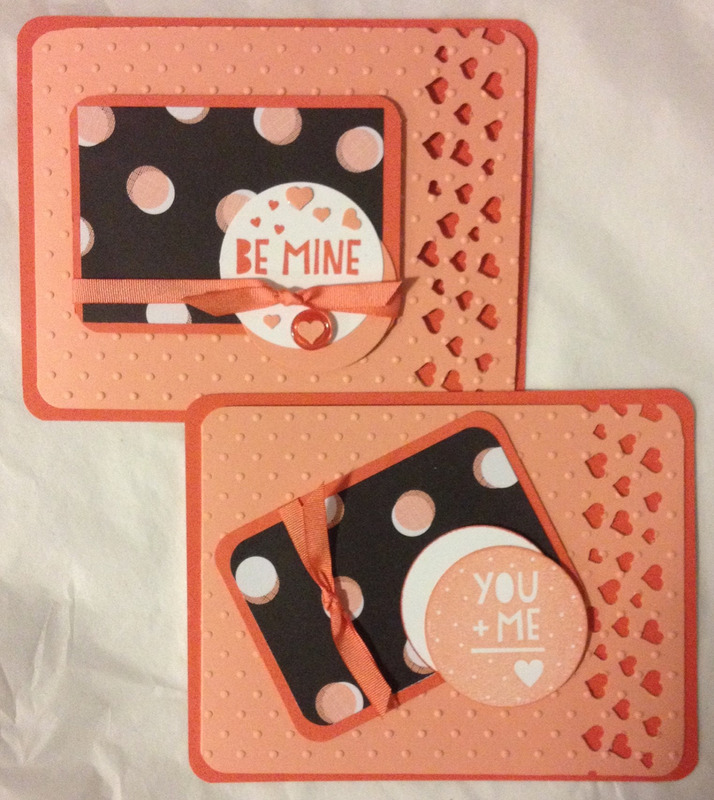 I used the new stamp set You Plus Me, and a piece of the Stacked With Love Designer Series Paper Stack. I started with a card base of Calypso Coral, topped with a front of Crisp Cantaloupe. 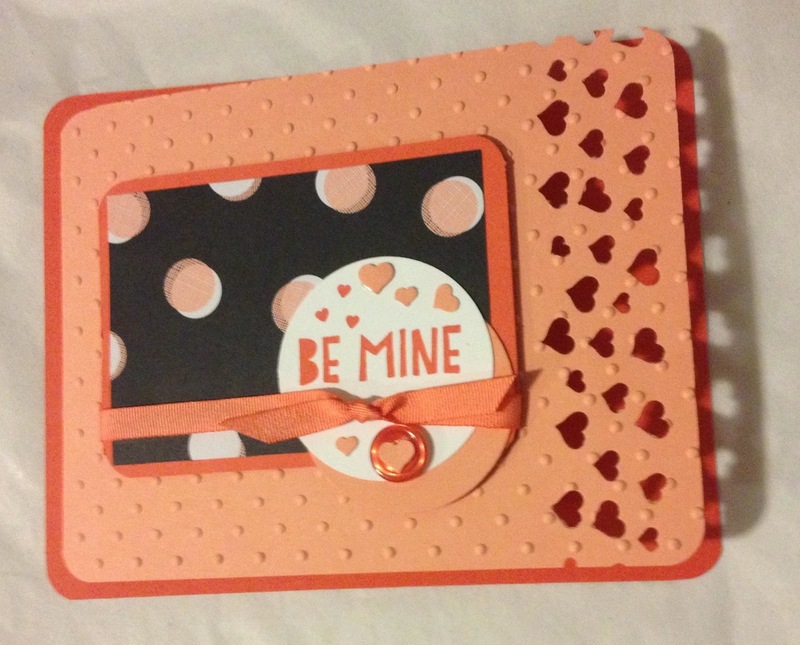 I punched the border with the new Confetti Hearts punch, and then embossed it with the Perfect Polka Dots Textured Impressions Embossing Folder. I layered a piece of the Stacked with Love DSP over a piece of coral card stock, and tied a ribbon from the Sale-A-Bration Best Year Ever Accessory pack. 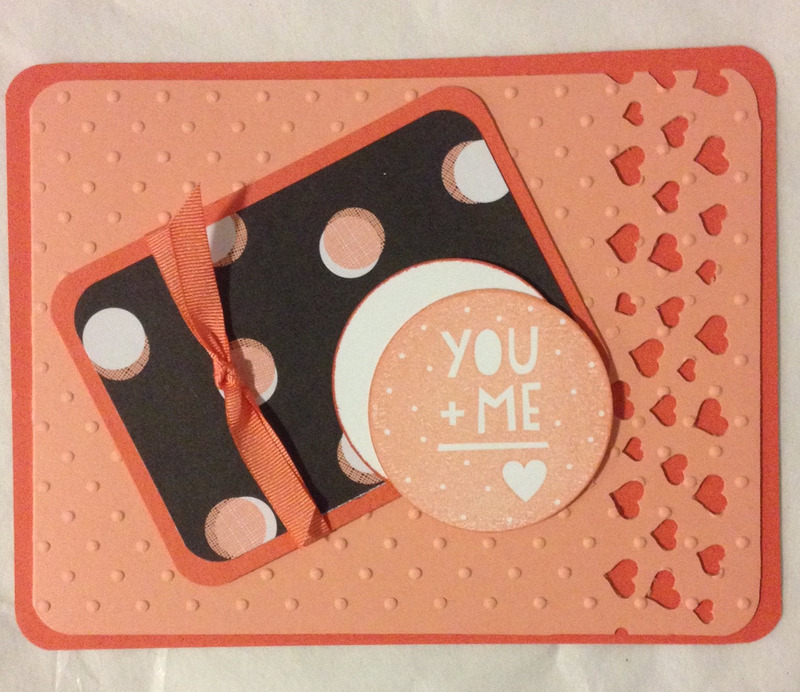 The circles are rolled over the Coral ink pad to darken the edges, and the Whisper White card stock was stamped in Crisp Cantaloupe and popped up over the DSP with Stampin' Dimensionals. 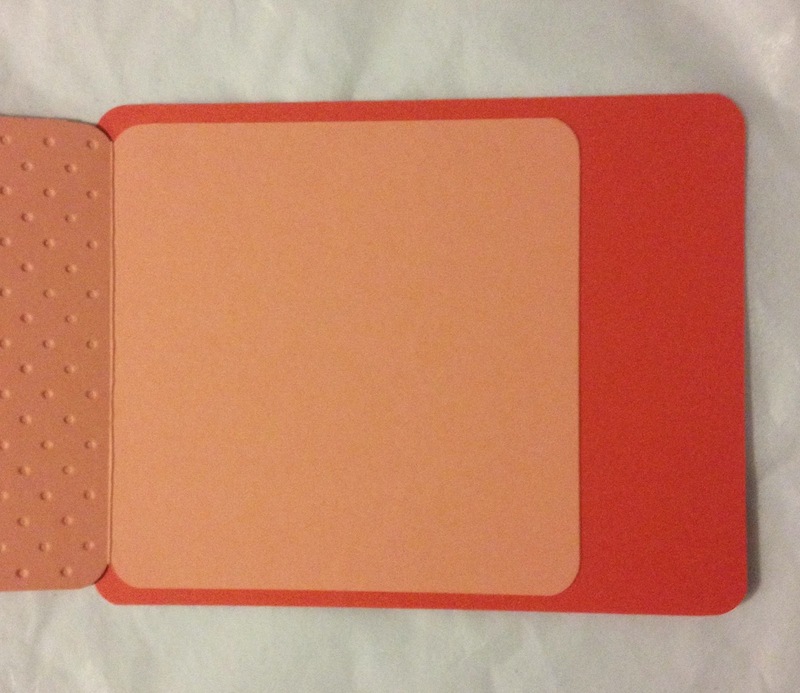 This is a kind of fancy fold, the card base in Coral is 4.25 x 5.5", not folded - just a flat card. 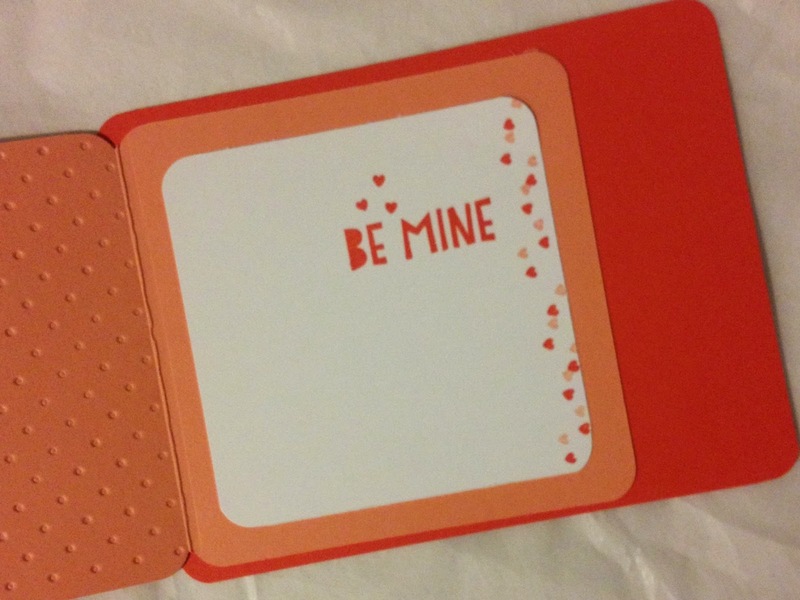 I cut a piece of Crisp Cantaloupe to 4 x 9.25", and scored and folded it at 5.25" This was to give the Confetti Heart Punch a peek through of the darker Coral, and to create an interesting card - special, just like its recipient! The second card is similar, I skipped the inside stamping. and added the ribbon in a different way, with a button from the Best Year Ever Accessory pack, embellished with some of the heart Confetti! Fun stuff coming tomorrow! Can't wait 'till you see all the goodies in the Occasions Catalog! The supplies used in todays cards are shown below.